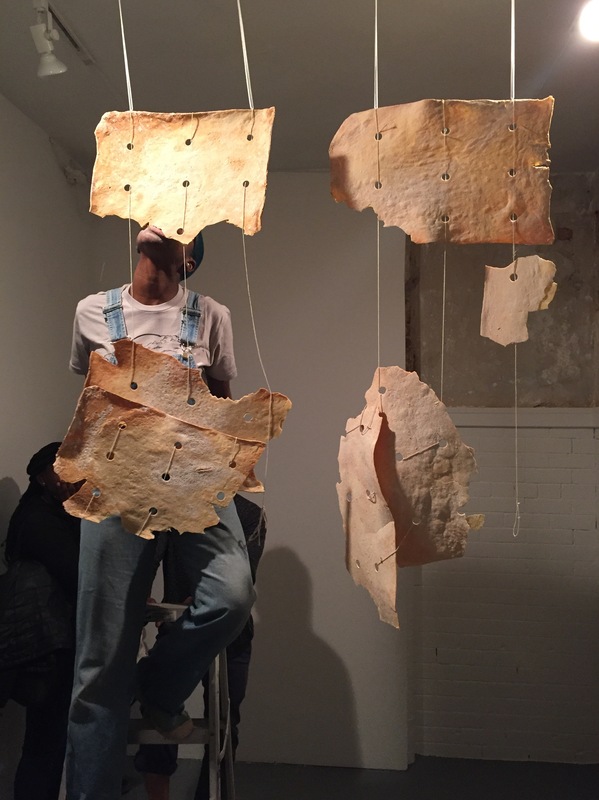 Art Review: "Kenya Eats a (Big) Cracker"
When New York artist Kenya (Robinson), recently named one of artnet's "Twenty Emerging Female Artists to Keep on Your Radar," tells me that she considers herself a minimalist, I start to laugh. This gregarious black woman's ongoing projects include "CHEEKY LaSHAE," a serial performance in which she and audience members sing karoake wearing a box-headed costume (think dancing popcorn boxes in 1950's movie concession ads) and #whitemaninmypocket a performance/photodocumentary project with "Dave," a pocket-sized generic-looking white businessman cast out of various materials. Surely, Donald Judd is rolling in his grave at the thought. But, Kenya isn't being funny. And, after witnessing her performance "Kenya Eats a (Big) Cracker" at Thomas Hunter Project Space at Hunter College earlier this month, I understand what she means. For this version of the "cracker" project (the first took place at The Kitchen in 2011) Kenya collaborated with Eddie Shumard, a chef and M.A. candidate in food studies, to create six large unleavened crackers. Each cracker was connected to the adjacent ones by a beige string laced through three regular rows of holes, then hung from the ceiling. Installed in a partially finished white box room with one wall of exposed and distressed brick, the sculptures did indeed invoke the simplicity, seriality and materiality of conventional minimalist art. Then, Kenya arrived. Petite, dressed in baggy blue overalls with very short hair, dyed a beautiful and obvious teal, her appearance spoke to the blurring and destruction of boundaries that was about to occur. Watched by a dozen onlookers, several of whom were black teens from the Brooklyn Children's Museum youth program, Kenya bit into a cracker. The sculpture swayed. Dramatically lit, it threw shadows like cave paintings on the exposed brick wall. Without using her hands, she ravenously, inelegantly bit off huge pieces, maneuvering her body around the hanging cracker carcasses. There was something vaguely ritualistic and primal about her consuming that contradicted both her work-a-day appearance and the absurdity of her attempt to eat these wobbly, oversized crackers. Fractured by the strength of her bite, cracker pieces fell to the floor and shattered, leaving a crunchy mess. Making occasional small talk and inviting viewers to taste the cracker (no hands allowed), Kenya eventually employed a paint-spattered ladder to finish the job. The artist, face dusted white with flour, thanked her audience, inviting those who hadn't already to partake. Finally, in the empty room, I watched as the strings, wound tightly by the artist's manipulations, began to relax, making the cracker remnants, which now resembled stretched hides or irregular hunks of drying flesh, slowly revolve around their string axes. Bruce Nauman's "Three Part Large Animal" hanging sculpture came to mind. Another connection to Nauman is the subversive wordplay that operates in this piece. Kenya, a Florida native, is well aware that "cracker," used by some white, poor rural East Coast Southerners as a badge of pride, has increasingly been re-appropriated by black rappers as a racial slur. Kenya calls her practice of addressing race, "unpacking whiteness." She is not interested in exploring black people as victims of systemic systems of white privilege, though she does not deny it. Rather, she wants to expose and play with white privilege in its many forms. It is this that makes many white people, including myself, uncomfortable. As a white woman, though not a poor Southerner, I could not fully distance myself from the visceral quality of Kenya's performance. She was attacking and consuming that cracker, like Saturn Devouring His Son, but at the same time, she was laughing and chatting with the audience. Although, I was acutely aware of being one of the few white people in that small space, the performance created a shared, though not "white-washed" space. All of us, black, white, female, male, young, old could eat from the cracker and enjoy the performance, while maintaining our own singular relationships with the work, relationships that depended in part on personal identity. Although today the essay seems almost anachronistic, it is worthwhile, in response to Kenya's claim to minimalism, to revisit Michael Fried's famous "Art and Objecthood" in which he attacked minimalism for its theatricality, reliance on the bodily experience of the viewer to finish the artwork and its "durational" quality, which he opposed to modernist art which "at every moment...is wholly manifest." Fried's valorizing vision of art that exists outside of time and place is also inherently and falsely apolitical. It reinforces the still prevalent point-of-view that if the art is "good," it will be recognized as such by all, no matter the race or gender of the artist or the critic. Recognizing that the qualities to which Fried so vehemently objects are ones that have the capacity to undermine art-world systems which are by and large operated for and by white men, it makes sense that Kenya would adopt and adapt these for her own practice. With its fragile, unconventional materials, "Kenya Eats a (Big) Cracker" shares an affinity with Eva Hesse's work and Janine Antoni's "Gnaw" in which the artist used her teeth as a sculpting tool to carve two 600 lb blocks, one made of chocolate, the other of lard. Like Antoni, Kenya often uses her own female body as a tool in the artwork. In this case, carving the cracker with her teeth, appropriating the material into her own black body and, through the process of digestion, transforming it from white to brown. So, in response to the question "Is Kenya (Robinson) a minimalist?" I would have to agree. Is Donald Judd rolling in his grave? I'd have to say "yes" to that, too. Documentation and Remnants of the performance will be on view until December 23rd 2016. The gallery is open to the public. Friday and Saturdays 12-6pm and by appointment. Kenya (Robinson) would like to thank Aisha Bell, curator, Jeffrey Mongrain, artist and head of the Ceramics department at Hunter and Eddie Shumard. chef.